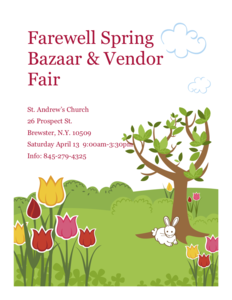 Please join St. Andrew’s Church this Saturday, April 13th, for our farewell Spring Fair. It is with a very heavy heart that we have to announce that our beloved church will be closing its doors, after more than 130 years, at the end of this month. We hope to see everyone this Saturday for our fair.